Martin wrapped his muffler tightly against his neck, then pulled his hat firmly down over his ears. The night was bitter cold. As his feet trudged through the snow, his thoughts warmed him. Soon he’d be sitting by the fire surrounded by his loving family, and together they would celebrate Christmas Eve. Thank You, dear Lord, for this blessed night, he prayed. Thank you for the precious gift of your Son, the King of Glory become Savior of those who believe. Martin’s eyes lifted heavenward in worship. It was then he noticed the ethereal display above him: evergreen branches lit by hundreds of tiny lights. Of course, it was the stars. But on that night, for Martin, they appeared to be sprinkled among the treetops. Oh, I wish the family were with me to witness this, he thought. And then he had an idea. When Martin finally crossed the threshold of his home, his wife and children were surprised to see him carrying a small evergreen tree. Whatever could this be, they thought, as Papa sent them to gather a small pot and candles. 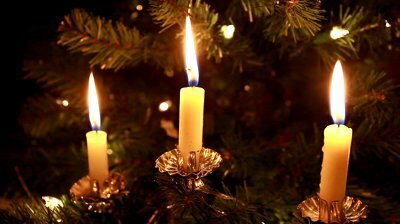 Together, Martin and his six children set up the tree and fastened candles to the branches. Then the room was darkened as the tree-candles were lit. And while the little tree glowed brightly in the corner, Martin told his family about the exquisite beauty he had witnessed—sparkling stars shining through the evergreens on a crisp and clear Christmas Eve. “It looked something like this!” he proclaimed and gestured toward the tree. The children stared in wonder at the glorious sight. Of course, no one can verify the truth of the legend. But I like to think that one of our most devout fathers of the faith brought to us this most delightful custom. Not only is the custom embraced by nearly everyone who celebrates Christmas, it embodies much symbolism. The tree of choice in most homes is the evergreen. Green represents life—the eternal life Jesus offers. The lights also remind us of Jesus, the Light of the world (John 8:12). He brings the light of sweet peace and effervescent joy that contrasts sharply to the darkness of fear. His Light transforms our quality of life. Jesus’ light reveals our sin, and then he offers to extinguish that darkness in our souls with his life-giving salvation. His Light also guides us along the path of life. Ornaments gifted to us over the years bring to mind precious family and friends. Miniature crèches, angels, shepherds, and wise men invoke fresh wonder in the glorious story of Christmas and God’s indescribable gift (2 Corinthians 9:15). Toys and teddy bears bring to mind the children for whom Christmas is the source of delirious joy. Almost as great is the vicarious pleasure we adults enjoy, while watching the young ones revel in all that is Christmas. Thou hast a wondrous message. Good will to men and peace on earth. I praise you, O God, for your goodness. Your blessing does indeed bring me much wealth (Proverbs 10:22), including: life eternal in your presence, Light to guide my way, precious family and friends with whom to enjoy the journey and with whom to celebrate this rapturous season of Advent. And then, would it be too trivial to thank you for Christmas trees? Their splendor graces our homes like no other adornment. May I enjoy the decorated tree, not as something bright and pretty in itself, but as a reminder of the Branch of the Lord. HE is the beautiful and glorious One (Isaiah 4:2). Love how you weave a tale and teach at the same time. Thank you, Jean. After twenty-six years in the classroom, I guess I can’t help weaving storytelling and teaching together–lol! Thank you for sharing this great legend. I had never heard of that before! I truly enjoyed this! Glad you enjoyed it, Cheri. I had fun visualizing Martin Luther and his six children reveling in the first Christmas tree (if indeed the legend is true)!